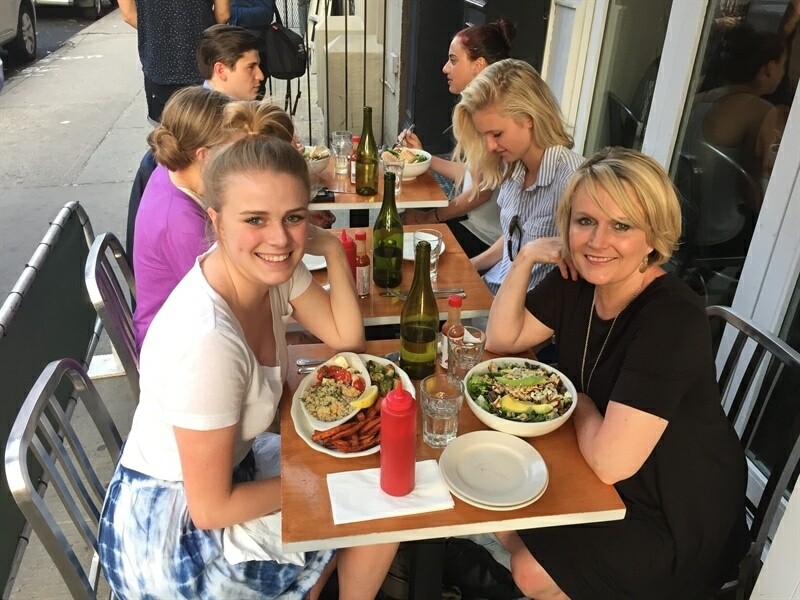 If you follow me on Instagram you know that I just enjoyed a fun and food filled trip to New York City to visit my youngest daughter who is living there this summer. First of all I have to say, as a parent, there is nothing better than seeing your child thrive in a new situation. 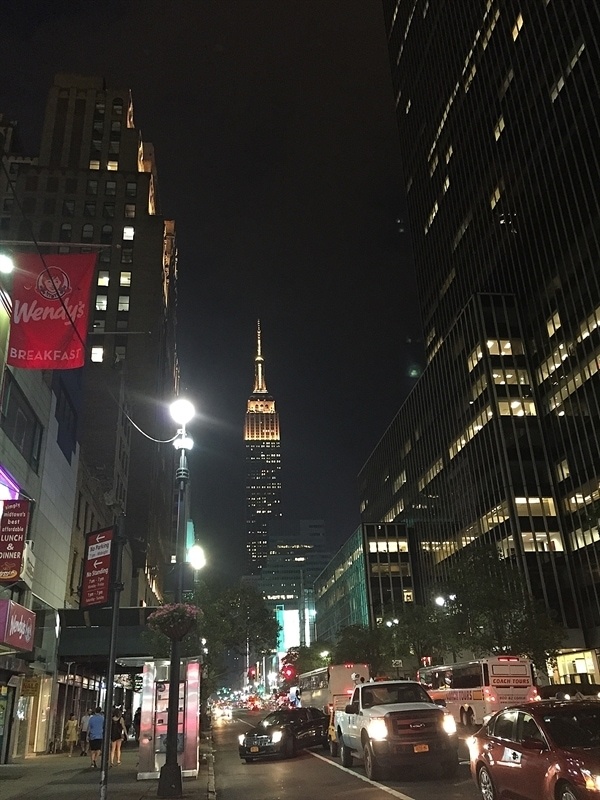 Tessa is loving every minute of her time in NYC and is relishing every minute there and discovering this new city. I couldn’t decide how to share my adventure with you. 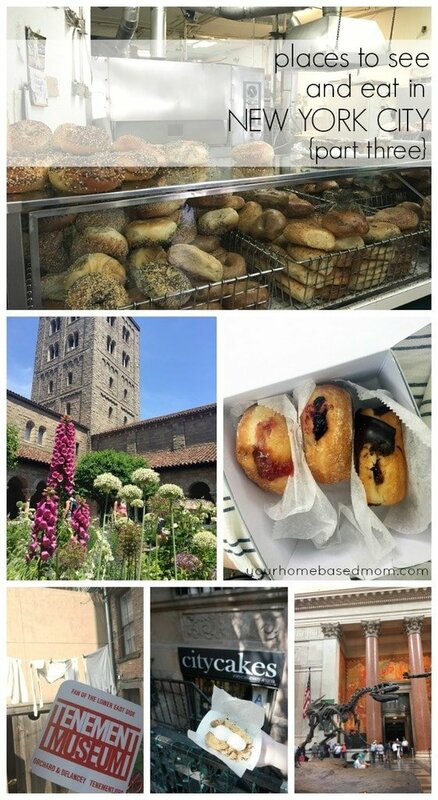 Originally I thought I would do one post all about the places we ate and another post about the places we visited but I decided to share with you what we did each day with both the things we did and the places we ate. I thought it would give you a better picture of what we did and where things were in relationship to other things. 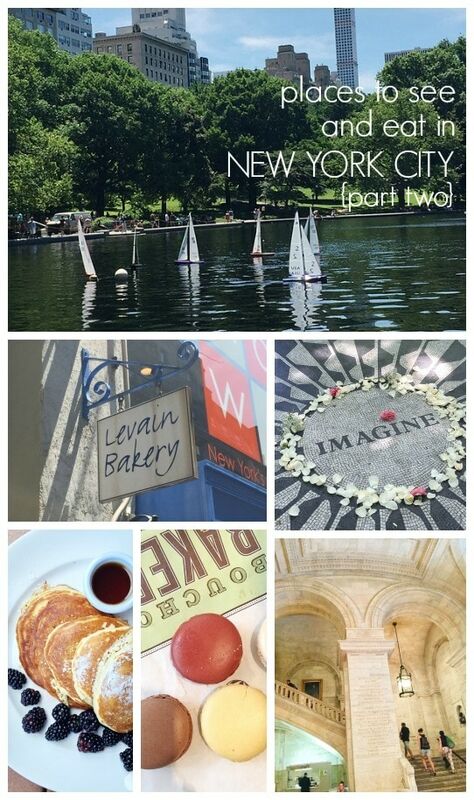 I was there for 5 days so you will my top places to see and eat in New York City Day One and Two in this post and then Day Three, Four and Five in another post. For Part Two go here. Warning: We did a lot and we ate a lot!! 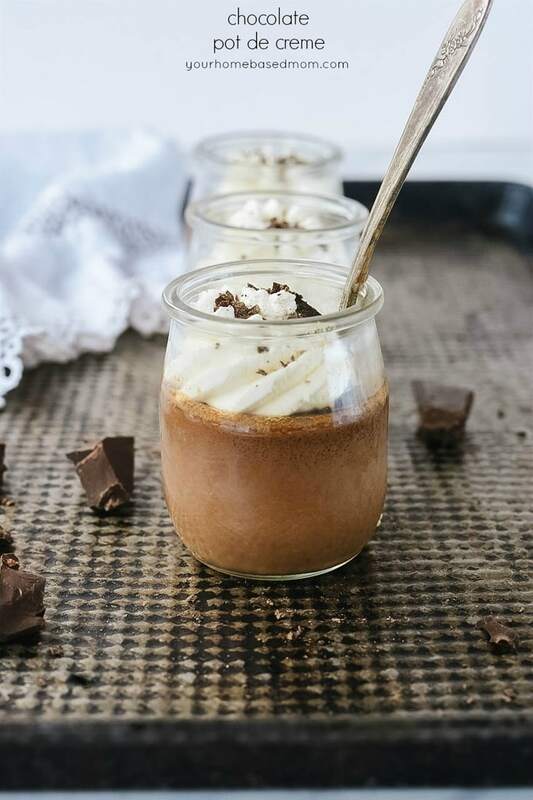 This is a long post!! I arrived in the city at 7:00 a.m. I took the red eye from Portland and fortunately was able to sleep most of the way so I headed straight to my hotel. Lucky for me they had a room ready for me so I showered, changed my clothes and then headed out for the day. I stayed right across from Herald Square at the Marriott Courtyard because it was close to Tessa’s work. Tessa had to work that day so I was on my own in the city. One of the best things I did was download the app HopStop. It is great for finding your way around the city. You plug in where you want to go and it tells you exactly what subway to take to get there or how to walk or how long it would take by taxi. We used it constantly. We took a cab a few times too and also used Uber App which worked great! Tessa taught me that if the cab has it’s light on, it is available for a ride. We rode the subway the majority of the time though. I highly recommend the 7 day unlimited pass, even if you are only going to be there for 3 days or so and plan on riding the subway a lot. It’s worth it! 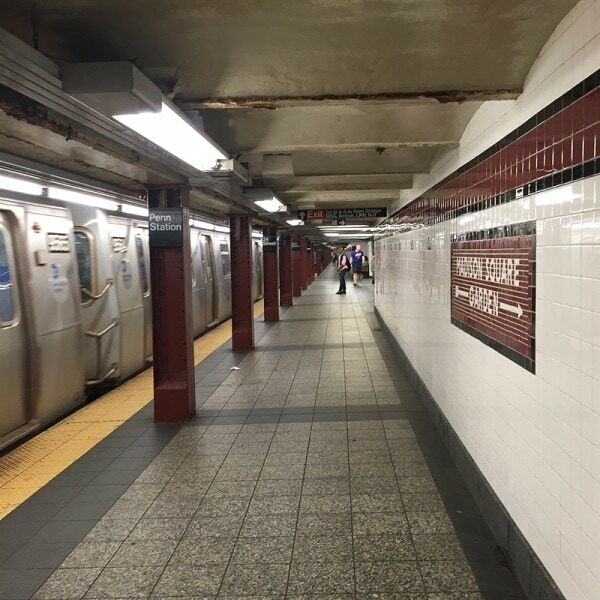 I did pretty well maneuvering the subway by myself once I figured the uptown and downtown thing out. I only got on the wrong train once and realized it after a few stops so just jumped off and headed the other direction! 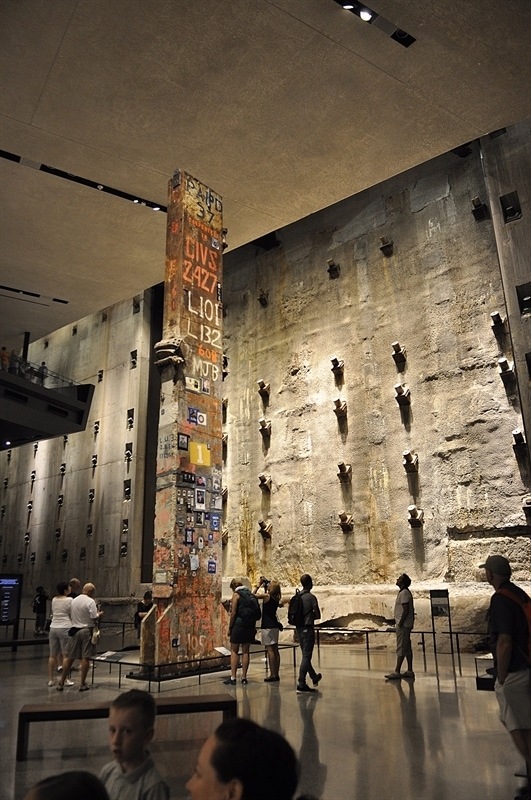 My first stop was the 911 Memorial & Museum. The last time I had been in NYC it was just a big hole in the ground so it was amazing to see what they had turned it into. 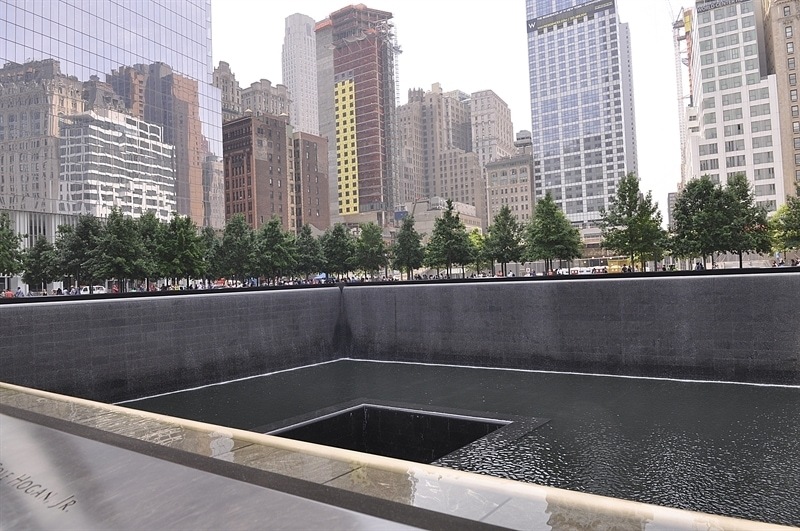 The fountains where the buildings once stood are beautiful and definitely feel like sacred ground. The Museum they have created is a must see. The minute I walked in the doors the tears began to flow and I think I pretty much cried through the entire museum. 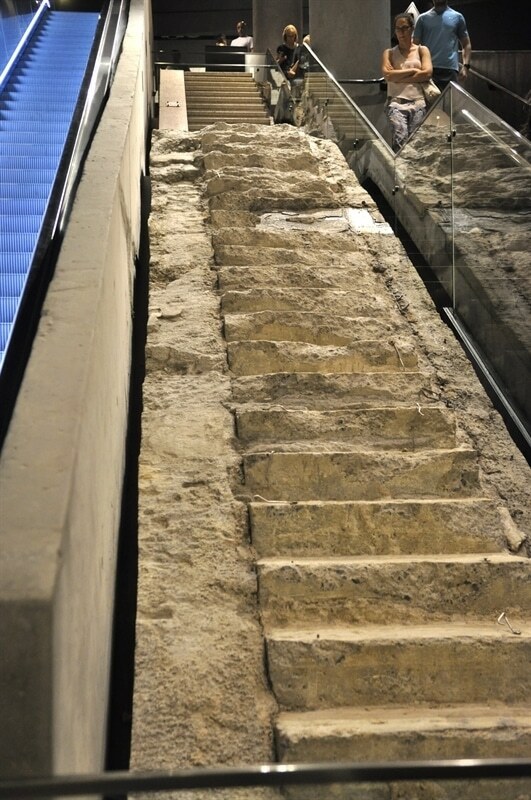 The stairs that many of the survivors used to escape the tower. 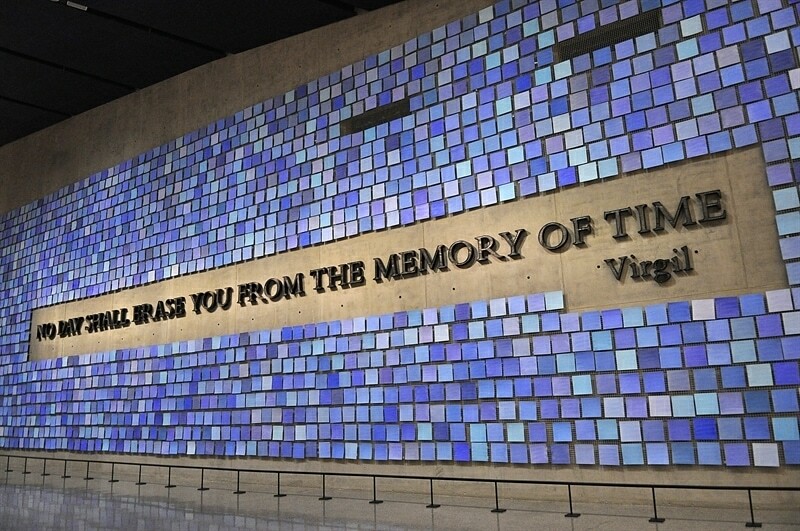 It is a beautiful museum and fitting tribute to all who perished that day. It truly is a day we will never and should never forget. 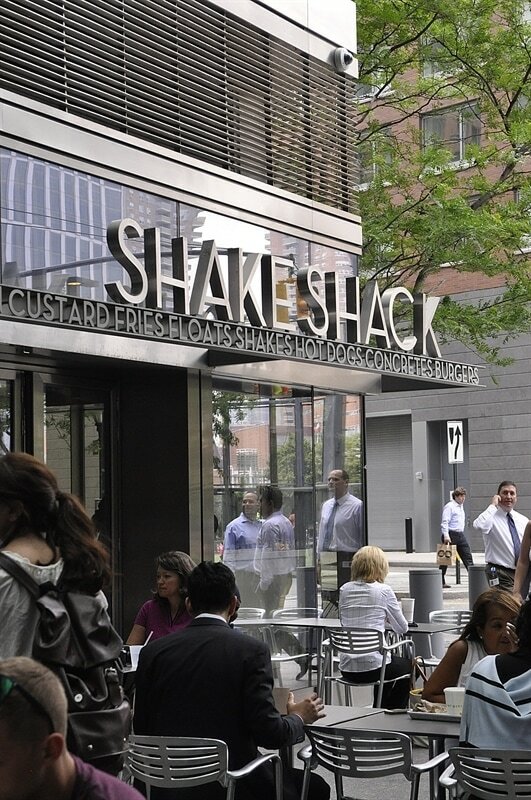 I was a bit hungry by the time I left the museum so I headed over to the Shake Shack which was just a few blocks away. Thanks to my trusty HopStop app I found it with no problem. 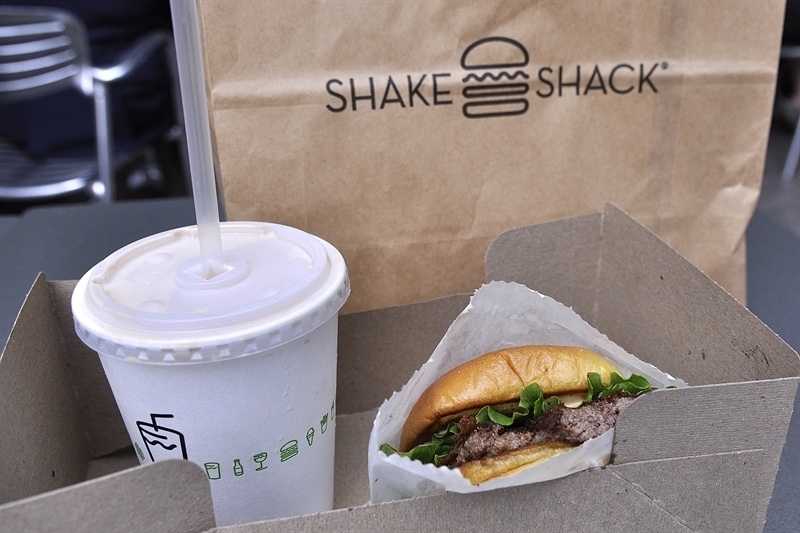 I have been hearing about the Shake Shack for ever so was anxious to try it. I ordered a burger with the yummy Shake Sauce and a Black & White Shake. It lived up to it’s reputation. 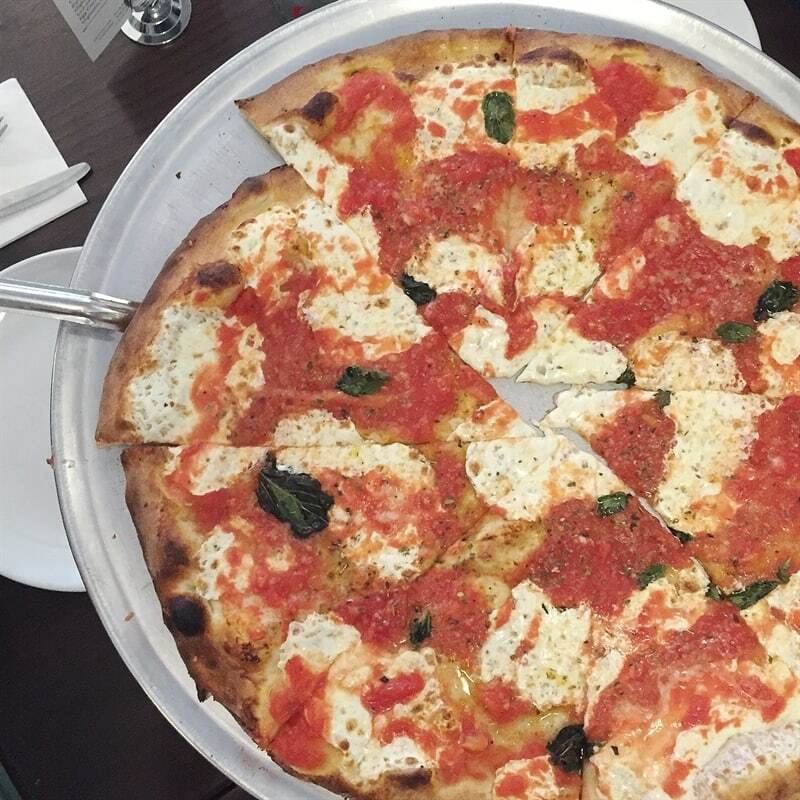 They have several locations throughout the city and there is also one at the JFK airport! My next stop was Battery Park for a boat ride over to Ellis Island. I purchased my tickets online but had to pick them up at the ticket office. There is a separate window for pre purchased tickets. 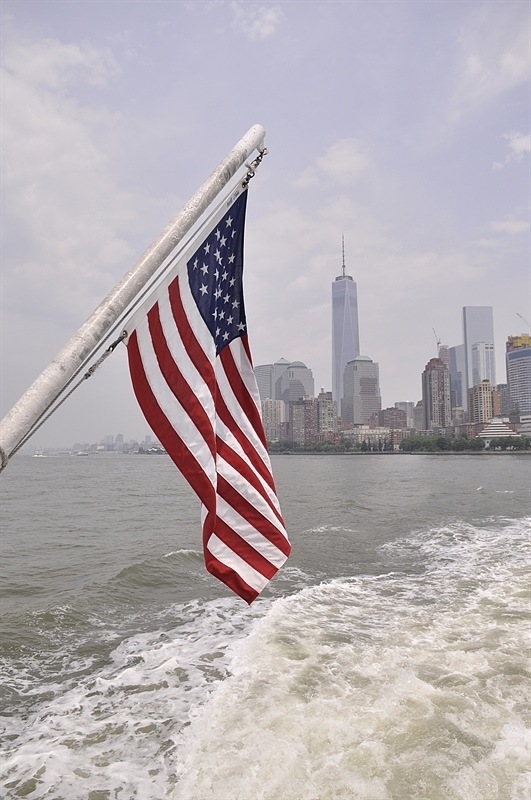 The boat takes you to both the Statue of Liberty and Ellis Island. 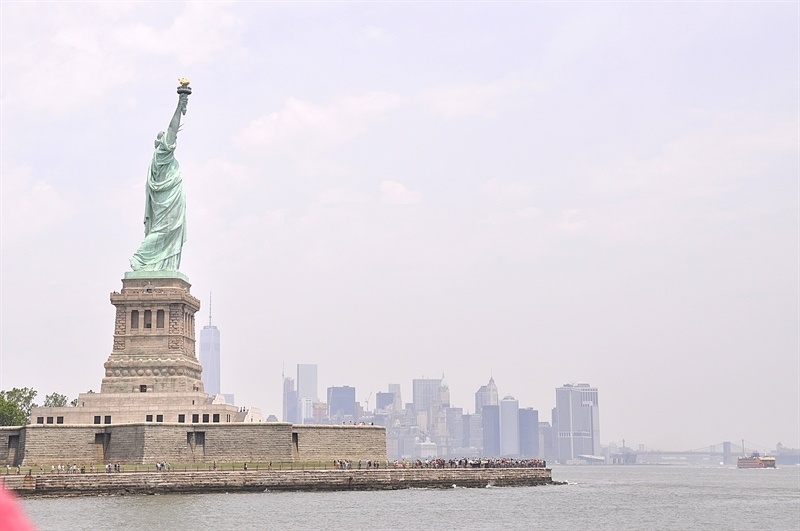 Since I had been to the Statue of Liberty a few times before I opted to stay on the boat when they stopped there and go onto Ellis Island. 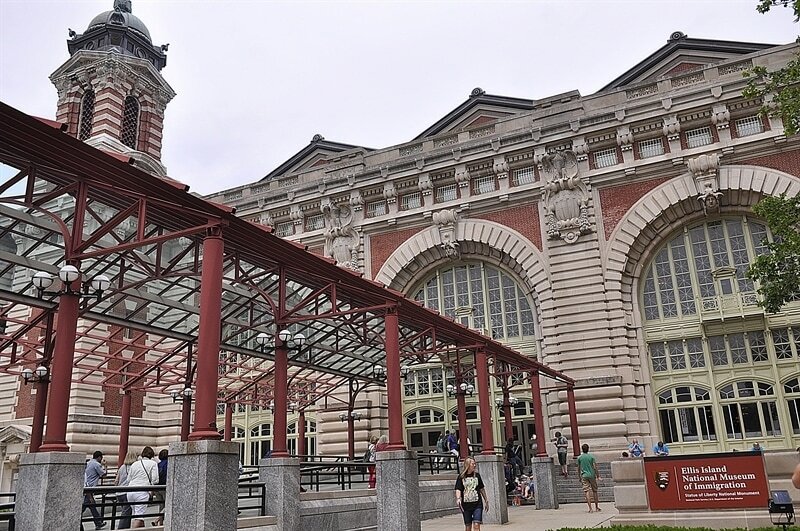 I had never been to Ellis Island and although I didn’t have any ancestors come through there I found the whole experience fascinating. You could feel the spirit of those who entered the doors as they came to America seeking a better life. 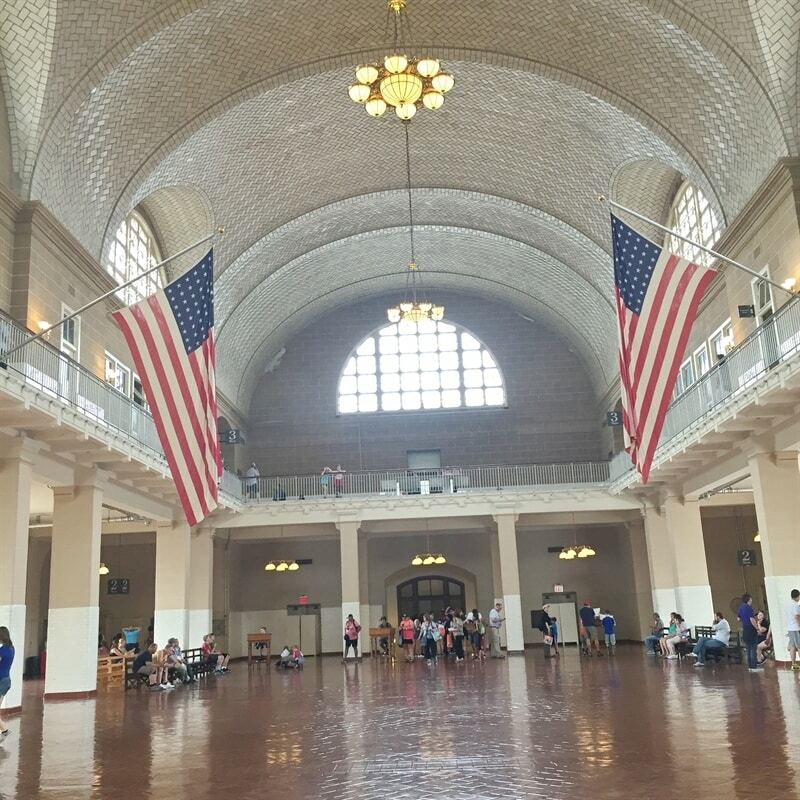 I loved seeing the faces through photos and reading the stories of many of the people who arrived at Ellis Island. I definitely recommend the free audio tour you can get when you visit. From there I headed over to the area where Tessa works to meet up with her after she was done for the day. It was a hot day so I stopped at Eataly for some amazing mint chip gelato. 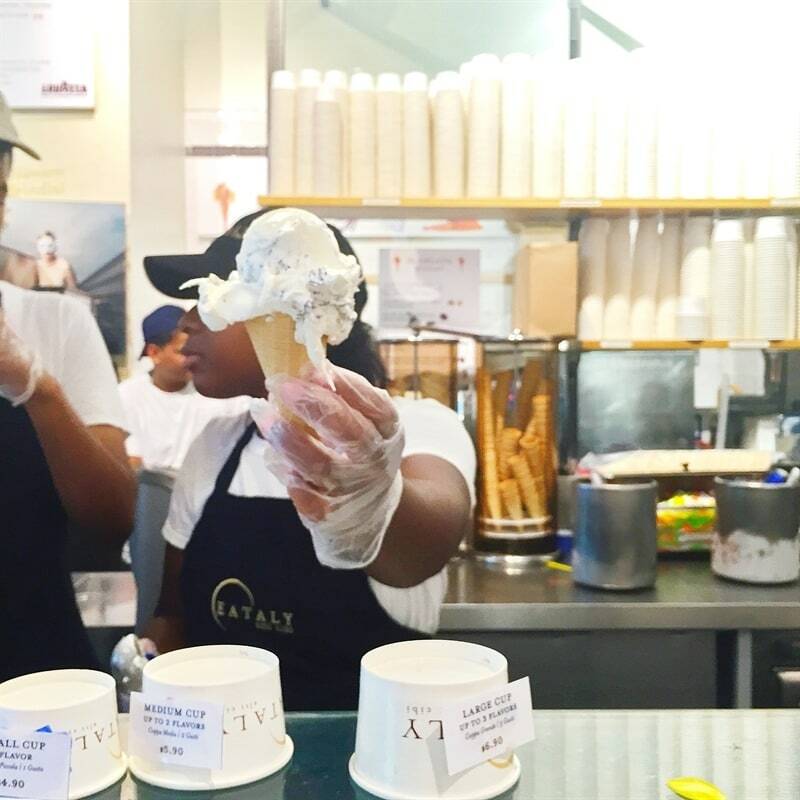 Eataly is such a fun place and I’ll share more details about it in my Day Two post. And yes, this was my second ice cream of the day if you are counting. I met Tessa after she was done working and we headed to the Chelsea area for dinner and a little exploring. We had dinner at a delicious, quaint, pretty little cafe called Westville. They have four different locations throughout the city and we were lucky enough to get a table outside. It was a perfect evening for outdoor dining. The food was amazing and so fresh. We shared a Westville Cobb with chicken and then had three sides – amazing roasted brussels sprouts, sweet potato fries and a quinoa salad with mango and pineapple that was our absolute favorite. Look for a copycat version of this salad coming to the blog soon!! We also had a delightful conversation with the two cute girls sitting next to us. Ended up one of them had recently arrived in NYC and was a PR major from BYU just like Tessa! We met them again at church on Sunday and I think Tessa has a new friend. It is a small and beautiful world. After dinner we walked over to Chelsea Market which is a fun shopping/food hall located in the meatpacking district of NYC . 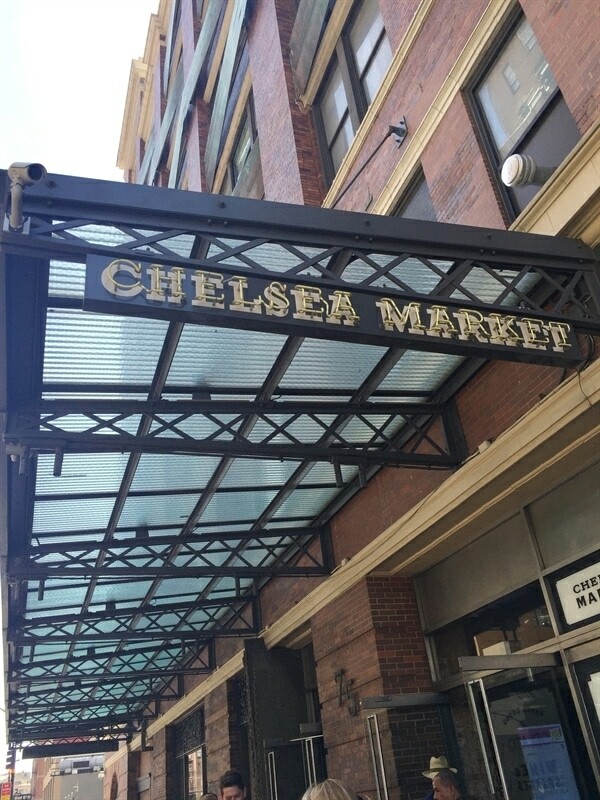 Lots of great places to eat so we knew we needed to make another visit later on in the weekend to try out some of the food places so look for more info on Chelsea Market in Post Two. 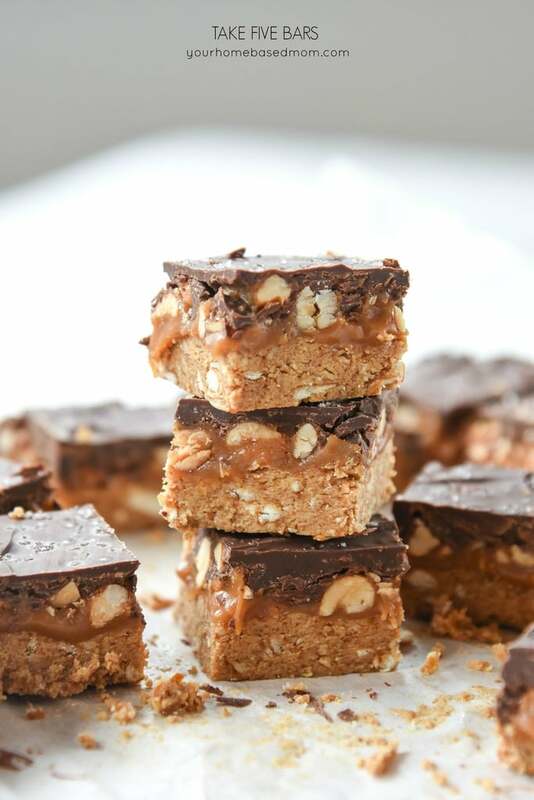 You can eat your way through there. There was a live band playing and lots of people enjoying the evening. 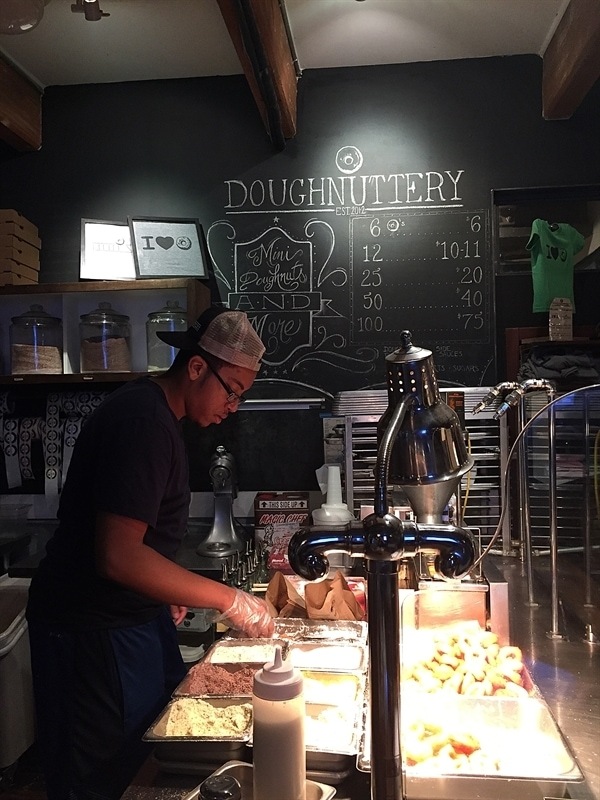 We needed a little dessert so we ended up at the Doughnuttery for yummy mini doughnuts. We opted for the vanilla glaze with sprinkles but they had all kinds of flavors because we are sprinkle girls. 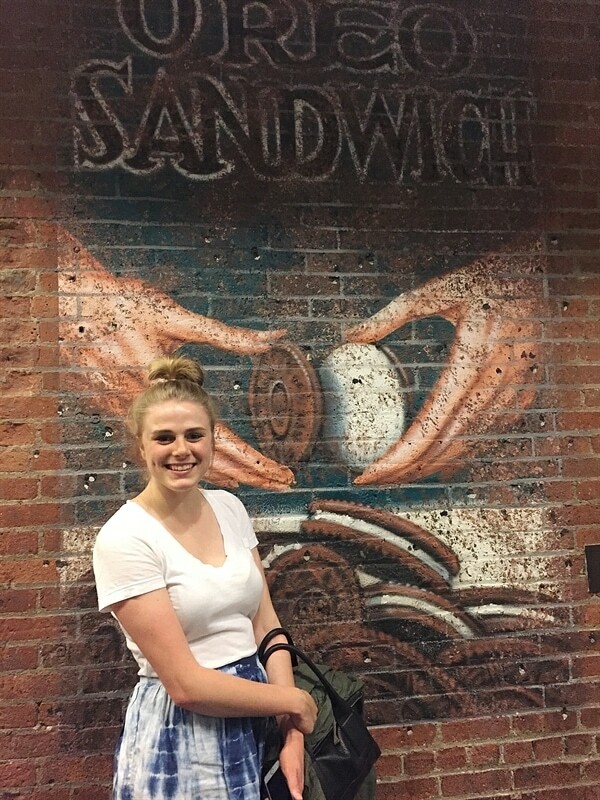 Be sure and find the fun Oreo wall in Chelsea Market for a photo! By this time I was pretty tired and Tessa had a date so I headed back to my hotel and left her at Chelsea Market to meet up with her friend. I managed to find my way back on the subway all by myself and was greeted by this pretty view when I emerged out of the subway station by my hotel. Hello Empire State Building! Friday morning we headed down to the Soho area of NYC which is located in lower Manhattan. Soho stands for South of Houston Street. It is a fun shopping area with lots and lots of shops! 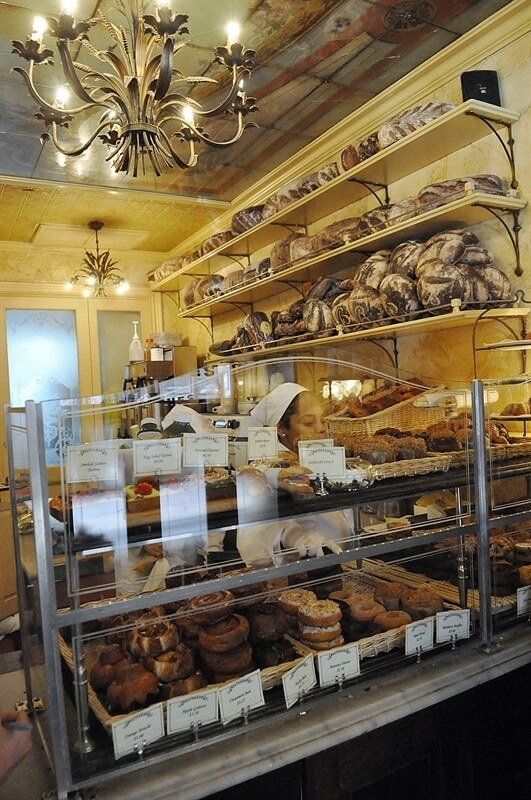 Our first bakery stop of the morning was Balthazer Bakery in Soho. It reminded me of the little patisseries we visited in Paris. We tried a cinnamon roll, raspberry danish and a pain au chocolate which was divine. From there we headed over to Dominique Ansel Bakery. 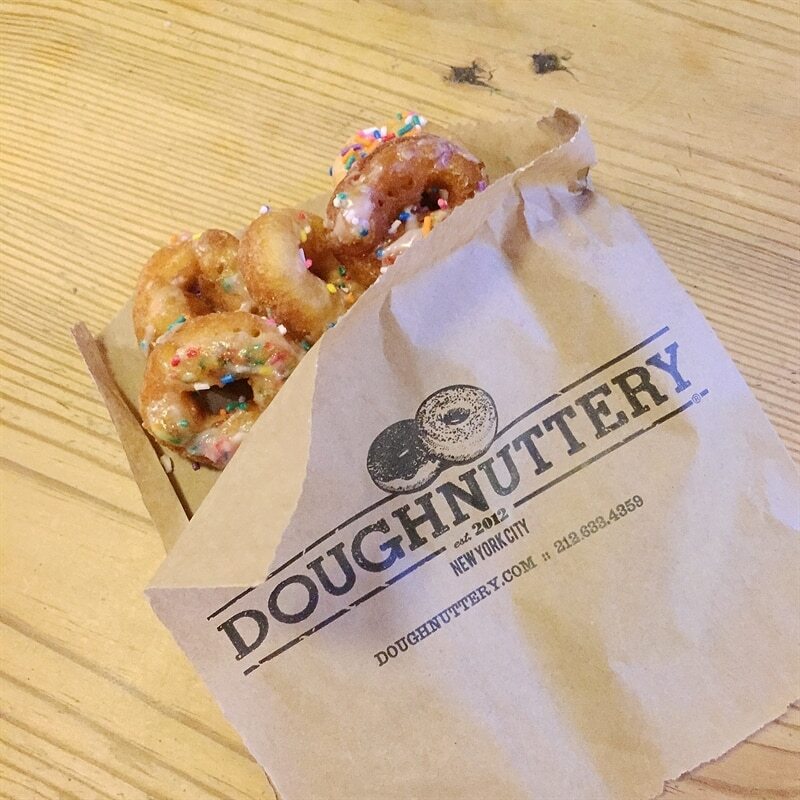 We knew we had to get there early so we could check out their amazing Cronuts, they are the originator of the cronut. 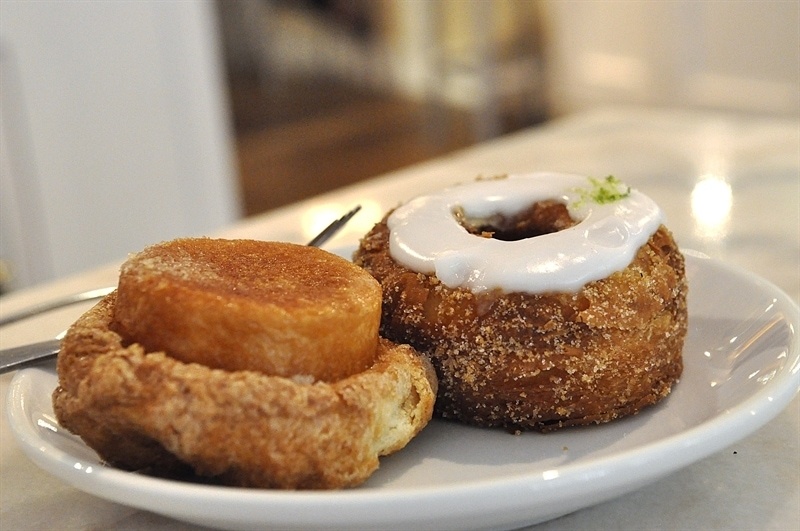 A cronut is a combination of a doughnut and a croissant and is basically to die for. They sell out of them every day! 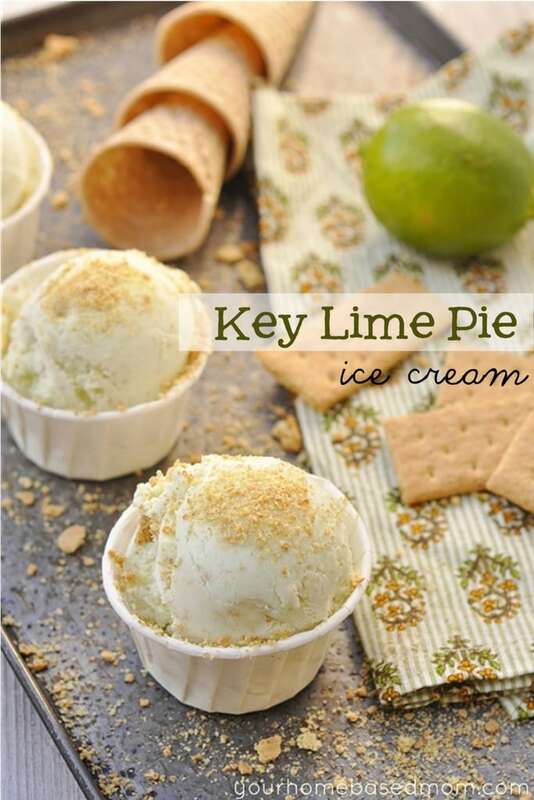 They have a different flavor of cronut each month and lucky for me this month was key lime! I thought I had died and gone to heaven when I bit into this baby. 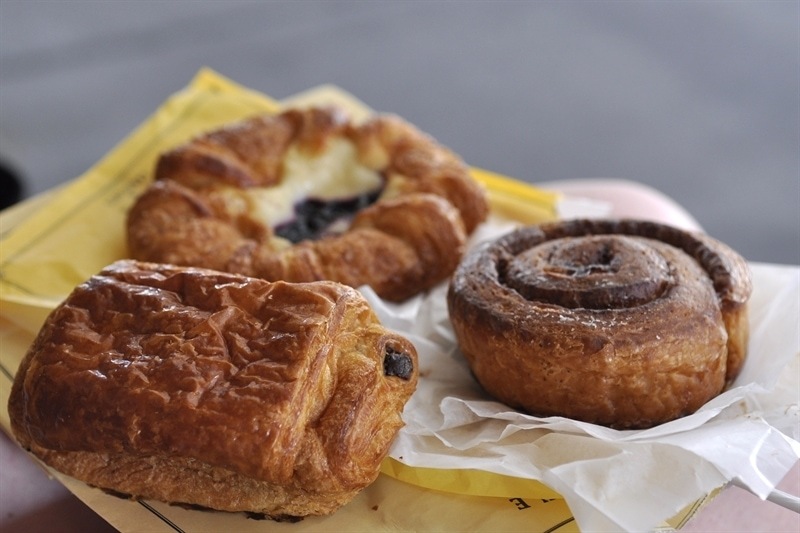 I guess people start lining up at 7 am when the bakery opens to partake of these beauties, so go early!! We also enjoyed an amazing Kouign Amann which is a tender, flaky, croissant-like dough with a caramelized crunchy crust piece of heaven! We needed to do a little shopping after our two bakery stops to burn off a few calories. Shopping burns calories, right? One of Tessa’s best friends and her mother and sister were in town so we headed over to Brooklyn to meet them for lunch. 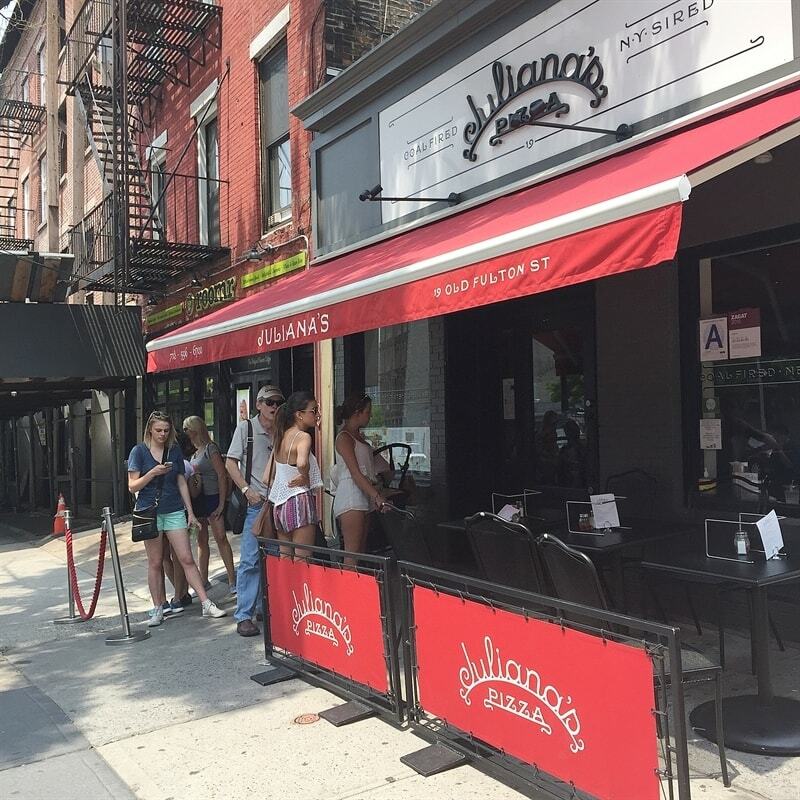 We enjoyed some amazing pizza at the famous Julianas which is at the foot of the Brooklyn Bridge. 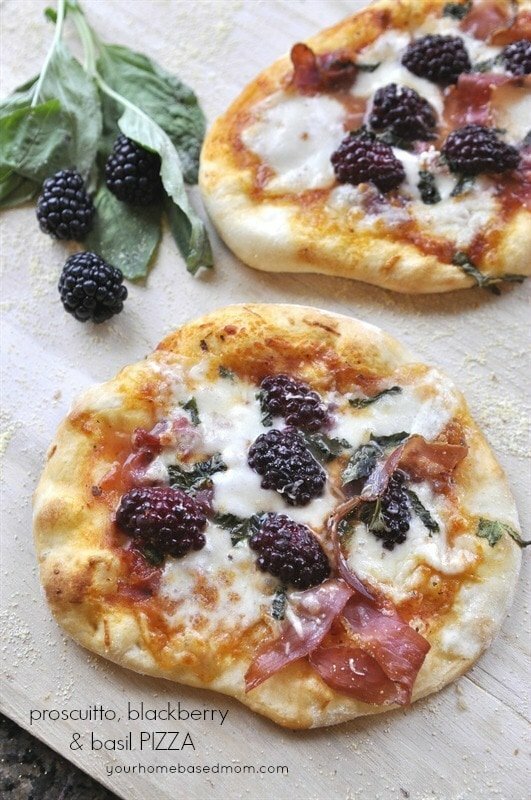 My favorite was the Margherita pizza! Again, in the effort to burn some more calories we walked back to Manhattan across the Brooklyn Bridge. It is a beautiful bridge and so fun to walk across. We got our share of walking in this day with over 30,000 steps!! 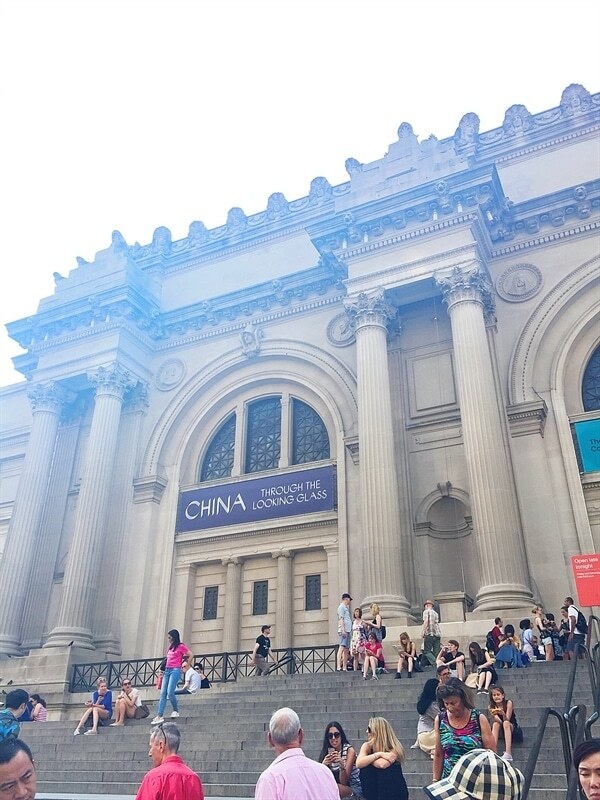 We then rode the subway up to the Metropolitan Museum of Art to see the Chinese Through the Looking Glass fashion exhibit. It was beautiful and I highly recommend it if it is still there when you visit. I am sure any exhibit at the Met would be wonderful. Admission is passed on donation. The steps in front of the museum are famous as is the museum and it is an iconic structure in the city. The museum borders Central Park. We headed back to our hotel after our visit to change for the evening. It had been a hot and humid day! 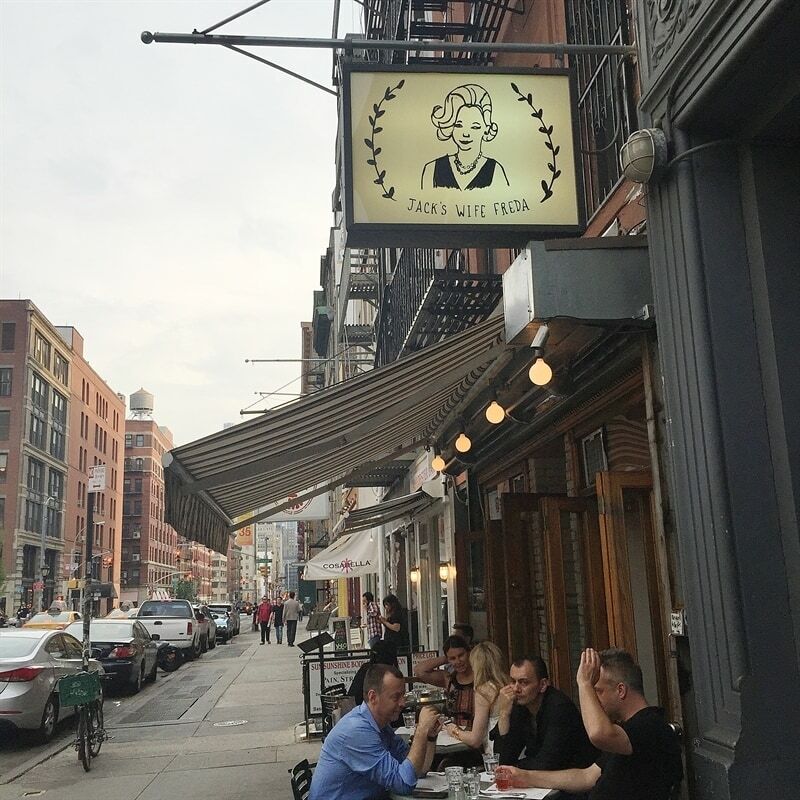 We went to dinner at Jack’s Wife Freda in Soho. 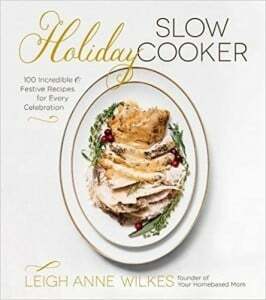 Tessa’s friend had highly recommended it and it didn’t disappoint. We were told we HAD to get the roasted cauliflower. Now neither Tessa nor I like cauliflower but we trusted their suggestion and man, are we glad we did. It was delicious!! Amazing. 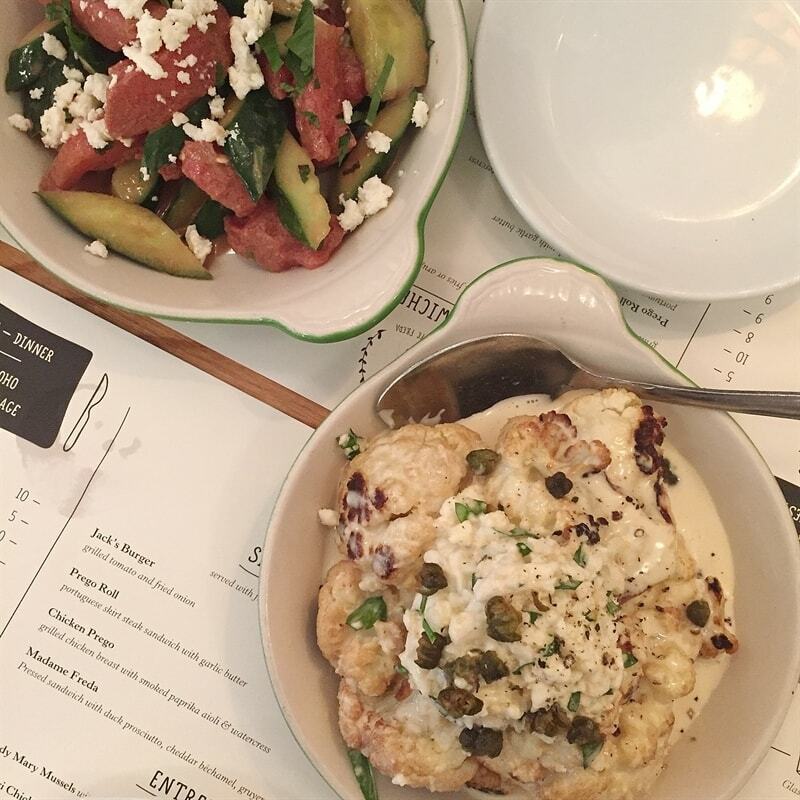 The watermelon, cucumber, feta salad was delightful too, but oh that cauliflower. 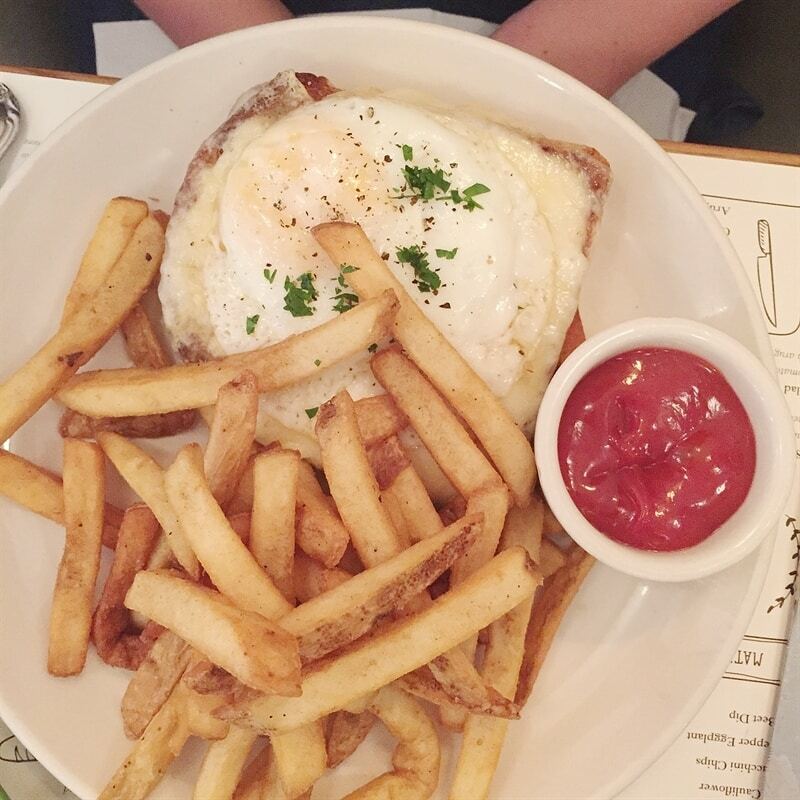 Tessa had the Madame Freda sandwich which she loved – it is duck prosciutto, cheddar bechamel, Gruyere and a fried egg. We loved it. I had the Peri Peri Chicken which was good too. 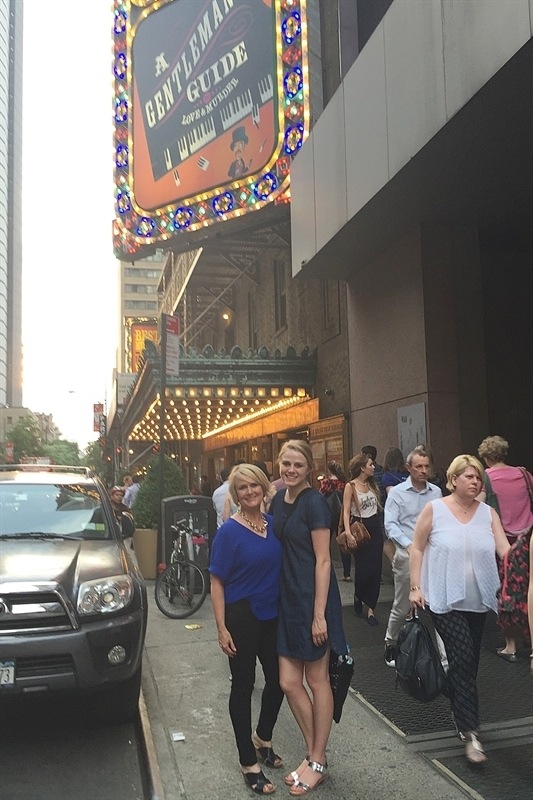 From there we headed to the Lyric Theater where we were seeing the Tony winning Gentlemen’s Guide to Love and Murder. A delightfully funny show. 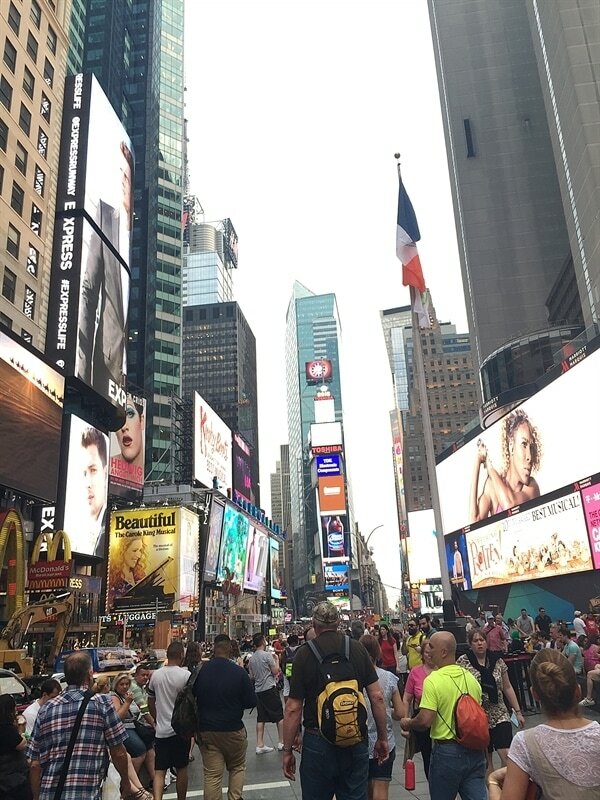 Of course a walk through Time Square is a must for any trip to NYC. I don’t like to spend too much time there though – too many people for me! That was the end of Day Two – stay tuned for Day Three, Four and Five and lots more walking and calories! 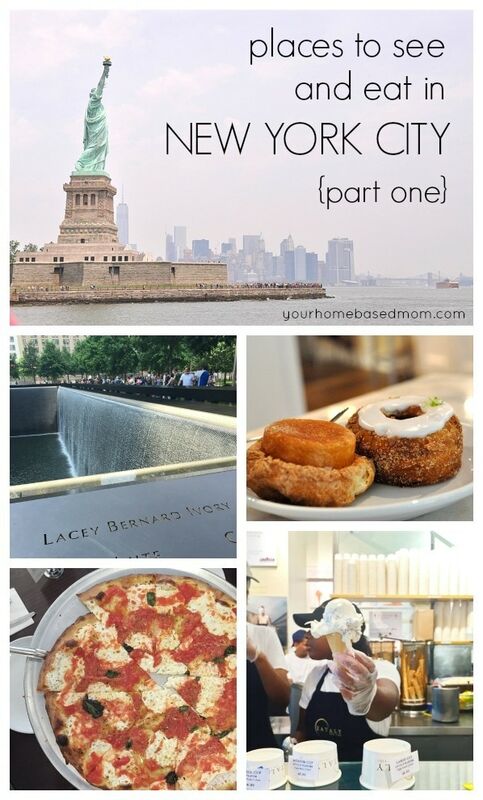 Part Two of my trip to NYC can be found here. We visited NYC about a year and loved it. We have talked about going back but now after reading about your time in there I REALLY want to go back. Thanks for sharing. 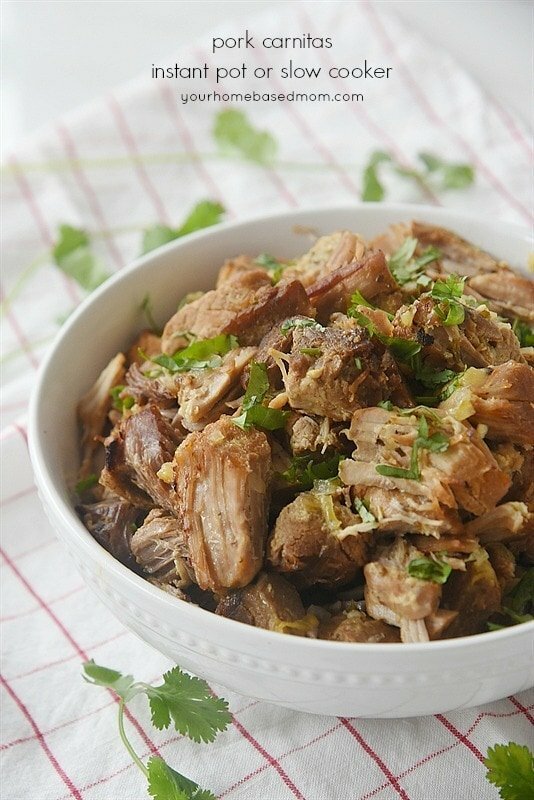 The cauliflower looks interesting, will you try to duplicate it? 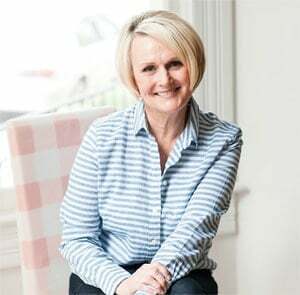 Pat, NYC is so fun! 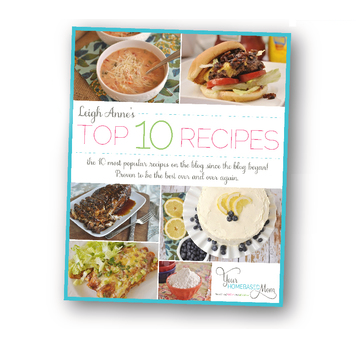 I am going to have to play around with that cauliflower recipe!! 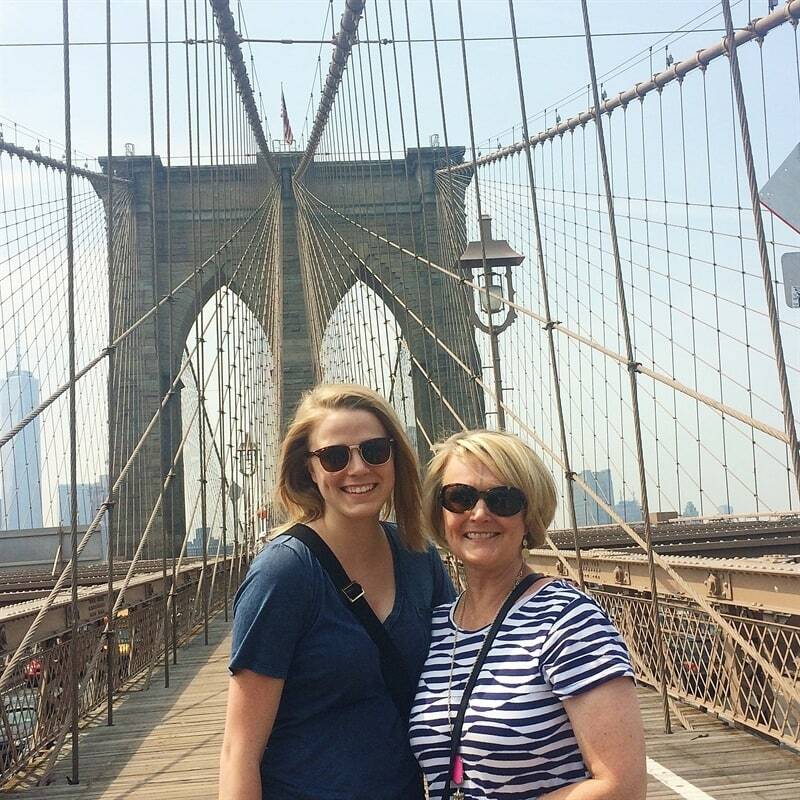 I visited NYC in May to visit my goddaughter, who graduated college. I live N of Seatle. So many different cultures in one place. Experienced the subway entertainment. Had the BEST soul food at Amy Ruth’s in Harlem. Need to visit again to walks the Brooklyn bridge and picnic in Central Park. My daughter is living just on the edge of Harlem – I’ll have to tell her about the restaurant. 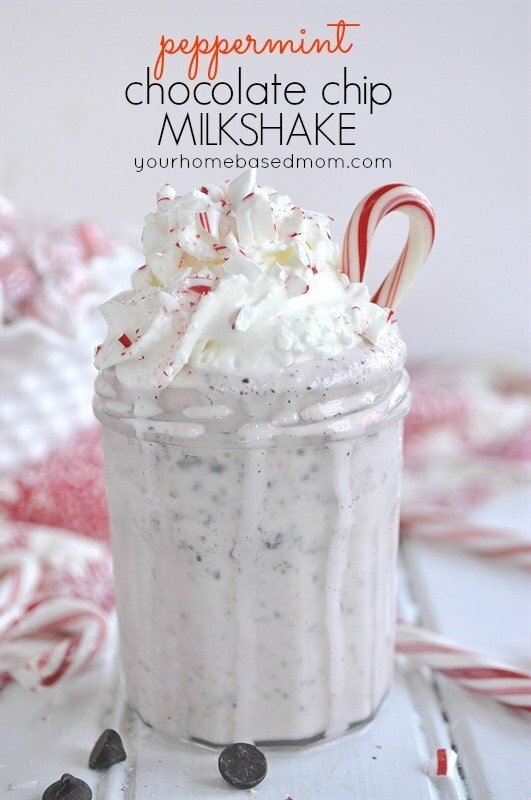 found your post via pinterest. . so glad I did! Thank you for your recommendations and pictures were perfect for our upcoming trip.